These chocolate peppermint Swig cookies will be the hit of your cookie exchange! Soft & tender, with a chocolate sour cream frosting & a hint of cool mint! Have you ever heard of Swig cookies? They’ve been huge on Pinterest for the last few years, but I only recently had the chance to give them a try. If you’re not already familiar, they’re big, chubby, soft sugar cookies, frosted with this incredible sour cream buttercream, and OMG! They are to-die-for. They had been on my baking list for a long time, when recently I was on an outing and someone baked up a batch to bring along and share. So, so good. I couldn’t get home fast enough to make them myself. I brought them to a friend’s house for a potluck and they were the hit of the party. Not long after that, my wheels started turning and I was thinking of all sorts of ways I could jazz them up for the holiday season. Chocolate peppermint Swig cookies were the winner! I mean, everything is better with chocolate, am I right? And these are SO chocolate-y. They’re made with Ghirardelli Bittersweet 60% Cacao Baking Chips AND Ghirardelli 100% Unsweetened ground cocoa, so the chocolate flavor comes through like whoa. If you’re a loyal reader here, then you know I am a huge fan of all things Ghirardelli, and have been for years. The quality is off the charts good, and it’s so convenient to be able to pick it up at my regular grocery store. Besides being full of rich, intense chocolate-ness, these cookies are so soft and tender they practically melt in your mouth. Honestly? I even left them out on my counter uncovered for a few days, and they STILL stayed soft. It was a Christmas miracle. And that sour cream buttercream? It will make you swoon. So rich and creamy, with a cool hit of wintry peppermint. It puts you right in the Christmas spirit. Don’t forget the peppermint bark! I used a combination of Ghirardelli Peppermint Bark squares and Ghirardelli Dark Chocolate Peppermint Bark squares, just chopped finely and sprinkled over the buttercream. It gives the perfect garnish! 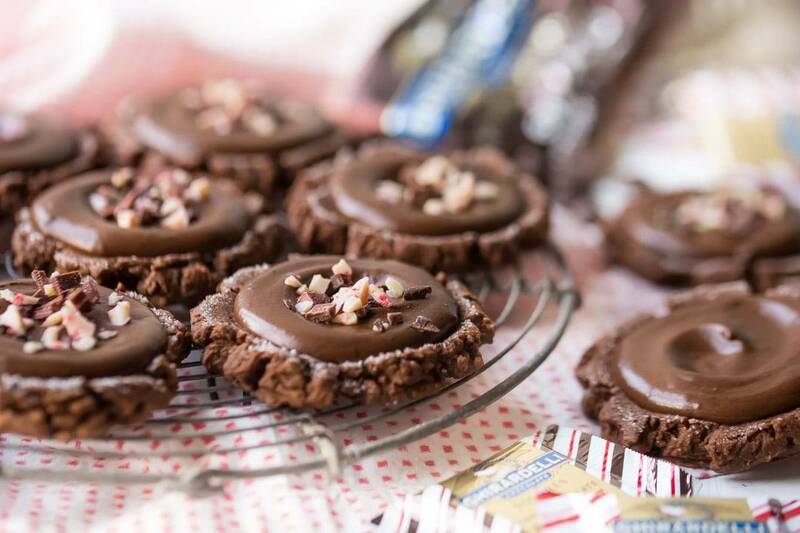 Be sure to add these chocolate peppermint Swig cookies to your holiday baking list this year! 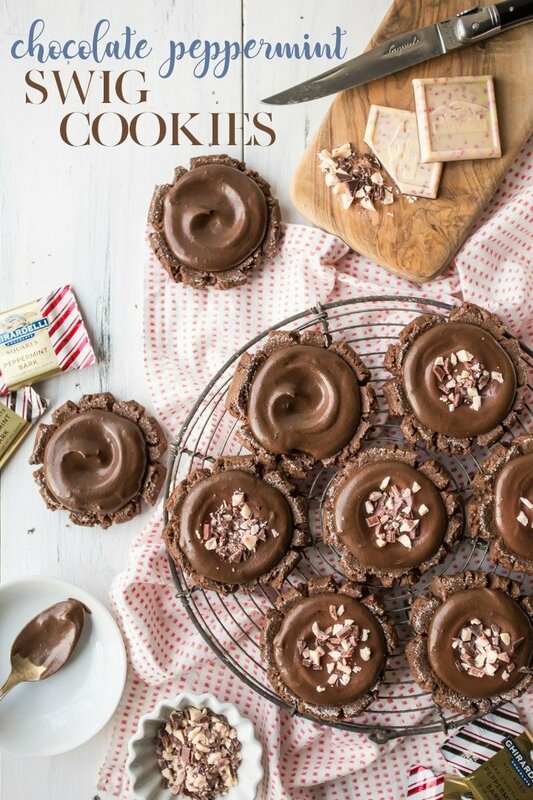 They’re perfect for a cookie exchange or for gifting. Your friends and family will love them and so will you! Preheat the oven to 350 degrees F and line baking sheets with parchment paper. Cream the butter, granulated sugar, and powdered sugar in a large bowl with an electric mixer until pale and fluffy (3 to 5 minutes on medium-high speed). Stir in the melted chocolate until incorporated. Scrape the bottom and sides of the mixing bowl with a silicone spatula, then add the oil, mixing on medium speed until smooth. Add the eggs, one at a time, mixing on medium speed until incorporated. Scrape the bottom and sides of the mixing bowl with a silicone spatula, then add 4 ½ cups of the flour, along with the cocoa, salt, baking soda, and cream of tartar, and mix until combined. If the dough seems sticky, add the remaining flour, 2 tablespoons at a time, until it can be handled easily. Scoop 2 tablespoon-sized balls of dough, and place them on the prepared baking sheets. Bake the cookies for 7 to 9 minutes, or until set around the edges but still very soft and tender. Cool completely, then frost with buttercream and garnish with chopped peppermint bark. Place the sour cream and butter in a medium mixing bowl and whip on medium-high speed until smooth. Add the powdered sugar, a cup at a time, stopping to scrape the bottom and sides of the bowl with a silicone spatula after each addition. Stir in the melted chocolate, cocoa powder, salt, and peppermint extract, then turn the mixer up to medium-high speed and whip until smooth and fluffy. Thin the frosting as needed with milk. 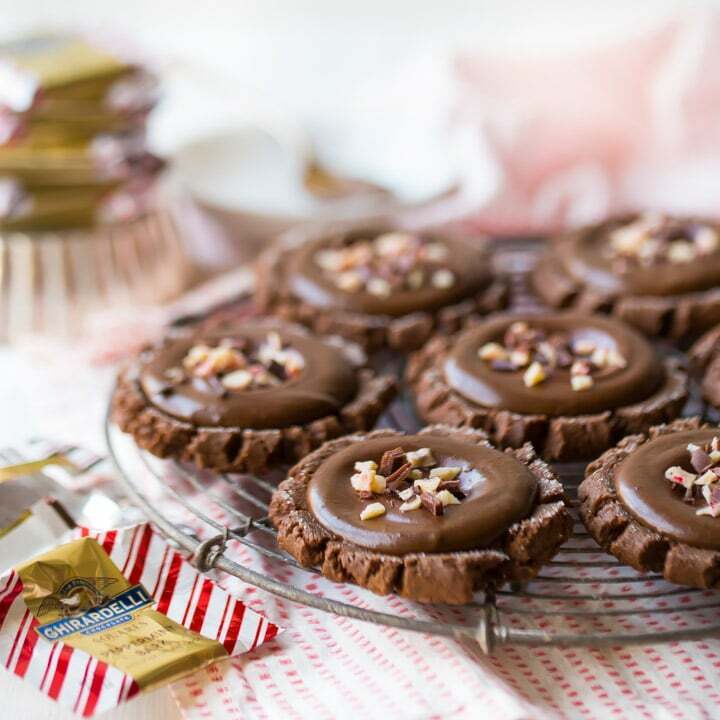 Spread about 1 ½ tablespoons of frosting on each cooled cookie, then top with a pinch of chopped peppermint bark, for garnish. Is there supposed to be 2 6-oz. of chocolate for the frosting? Just checking–tha. No, that was a mistake! Thanks for pointing it out Glenda. It’s all fixed now! Whoa, do these look amazing. 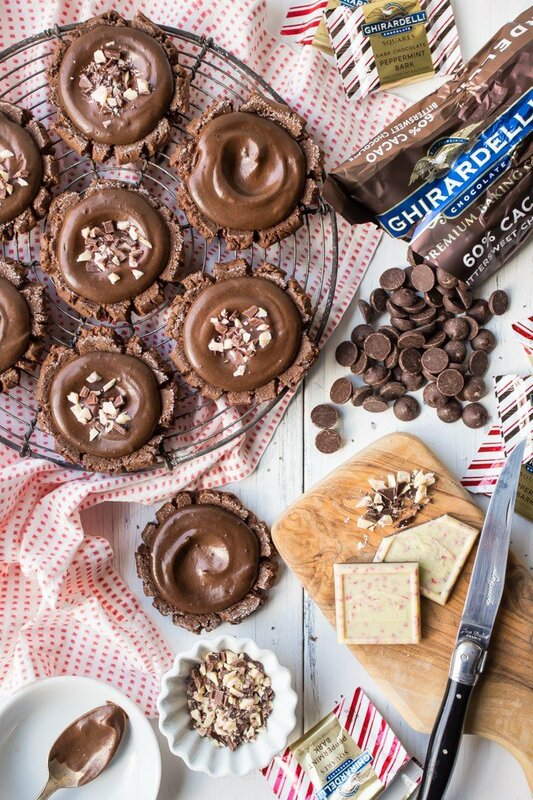 LOVE a good chocolate peppermint combo around the holidays- these are definitely getting added to my “to-bake” list! So happy you like them Karly! I couldn’t get enough. I may have to make them every year now! Question about the frosting! Does it hold up for a few days? Ive made the base of these and they are amazing! Im going to give them as gifts this week coming, can I frost them ahead of time? Or should I wait until the day of giving them? Does the frosting harden so I can stack them is what I’m getting at I guess lol. Hey Jessica! The frosting does harden/crust over. I think frosting them ahead of time is definitely the way to go! Good luck and enjoy! Delicious combination! Perfect for holiday cookie trays!